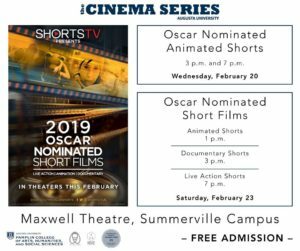 Wednesday, February 20th & Saturday, February 23rd, 2019 | Location: The Maxwell Theatre The Augusta University Cinema Series is showing a collection of Oscar Nominated Short Films! Showtimes: Wednesday, Feb 20th Animated Shorts | 3 PM - 7 PM Saturday, Feb 23rd Animated Shorts | 1 PM Documentary Shorts | 3 PM Live Action Shorts | 7 PM This event is FREE! Visit the Cinema Series Facebook Page HERE!